This is a silent Fox Movietone News reel which depicts Dr. McCleery standing in front of the wolf park entrance and then walking in the fenced-in runway between the wolf pens as the wolves fight through the wire of the pens. Visitors to the wolf park can be seen outside of the pens. This film is probably from the early 1930s judging by the glue on the splices, the Movietone logo, and Dr. McCleery's age. This item was generously contributed by Ivan McClain. This item is in-copyright. Copyright belongs to Fox News Channel. 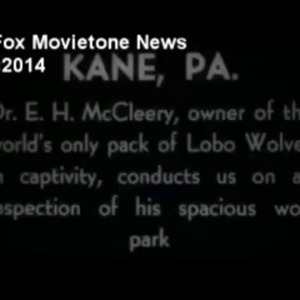 Christopher Morgan at ITN Source granted the Dr. McCleery Lobo Wolves Digital Archive permission to post this film on this website on the condition that a "Fox Movietone News" watermark is displayed on the footage.